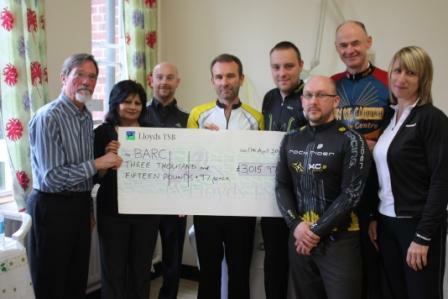 Keen cyclists from Sandwell and West Birmingham Hospitals NHS Trust have made their annual donation to charity. Every year, staff from the Trust get together to take part in a sponsored long-distance bike ride and the money raised goes towards good causes. This year, the riders presented £3,015.97 to Birmingham Arthritis Resource Centre (BARC) after completing the 150-mile, three-day trip across Cornwall from Land’s End to Bude in September last year. BARC supports arthritis sufferers in Birmingham and Sandwell through education of patients. Chandrika Gordhan, manager at BARC, added: “Because of the makeup of the West Midlands, translation needs are often there so the money will allow us to do some translation in different languages. In return, it will help people with arthritis and their carers. “This was an amazing boost. Every penny was used to make a difference in people’s lives. The cyclists will be embarking on another charity ride in September which will take them along Hadrian’s Wall.